Recombinant fragment, corresponding to a region within amino acids 55-469 of Human STK33 (Uniprot ID: Q9BYT3). 293T, A431, H1299, HeLaS3, HepG2, MOLT4 and Raji whole cell lysates; HeLa cells; Human Cal27 xenograft tissue. Our Abpromise guarantee covers the use of ab155056 in the following tested applications. WB 1/500 - 1/3000. Predicted molecular weight: 58 kDa. Highly expressed in testis, fetal lung and heart, followed by pituitary gland, kidney, interventricular septum, pancreas, heart, trachea, thyroid gland and uterus. Weak hybridization signals were observed in the following tissues: amygdala, aorta, esophagus, colon ascending, colon transverse, skeletal muscle, spleen, peripheral blood leukocyte, lymph node, bone marrow, placenta, prostate, liver, salivary gland, mammary gland, some tumor cell lines, fetal brain, fetal liver, fetal spleen and fetal thymus. 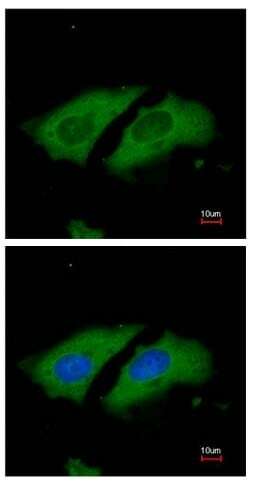 No signal at all was detectable in RNA from tissues of the nervous system. Immunofluorescent analysis of paraformaldehyde-fixed HeLa cells labeling STK33 with ab155056 at 1/200 dilution. Lower image is merged with DNA probe. 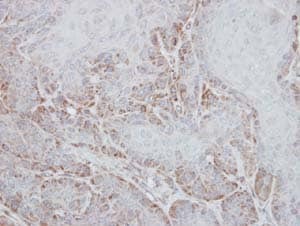 Immunohistochemical analysis of paraffin-embedded Human Cal27 xenograft tissue labeling STK33 with ab155056 at 1/100 dilution. ab155056 has not yet been referenced specifically in any publications. Publishing research using ab155056? Please let us know so that we can cite the reference in this datasheet. There are currently no Customer reviews or Questions for ab155056.